Preheat the oven to 350°. Season the pork with salt. In a large ovenproof skillet, heat 1 tablespoon olive oil over medium high heat, then brown the pork. In a small bowl, combine the apple butter and cayenne; slather the mixture onto the pork. Roast until a thermometer inserted into the center registers 145°, about 45 minutes. Meanwhile, in a medium saucepan, bring the rice, coconut milk, 1/4 cup water and 1/2 teaspoon salt to a boil. Cover and cook over low heat for 25 minutes. 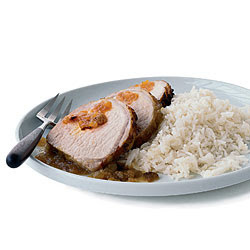 Fluff the rice with a fork and serve with the pork.